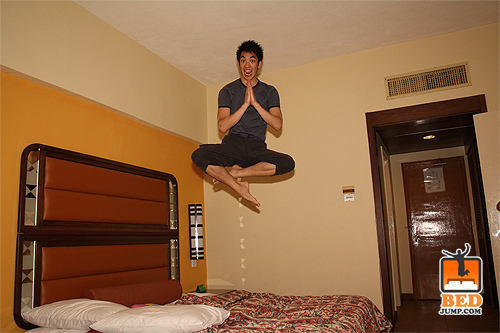 I have recently happened on the zany new trend of “Hotel Bed Jumping” and am certainly intrigued by this phenomenon. First of all, lest your mind go there, it is NOT an immoral activity. When I told my adult daughter I was thinking of writing an article about bed Jumping, she was silent a few moments, and then said she could not believe I would write about something like that. The jumping takes place in hotels primarily, because these beds are higher, fluffier, and conveniently, do not belong to the jumper. Jumpers are professionally or casually attired, depending on the scenario they have dreamed up. I am wondering what the hotels think about the trend. Or more importantly, the helpless beds. 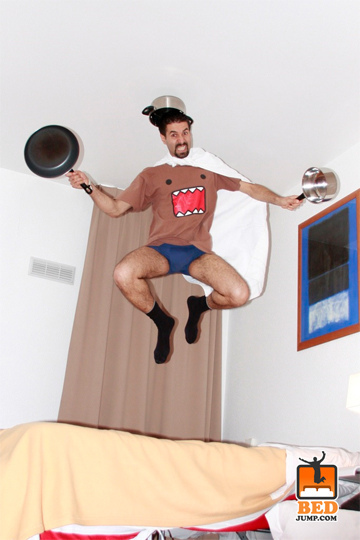 The goal is to photograph oneself in mid-launch enroute to the bed, ostensibly suspending gravity, in a memorable pose. The jumpers go to great lengths setting up tripods, timers, launching themselves repeatedly, creating funny little mid-air scenarios, and scurrying to explain when hotel personnel pound on the door demanding to know what in the world is going on in there. 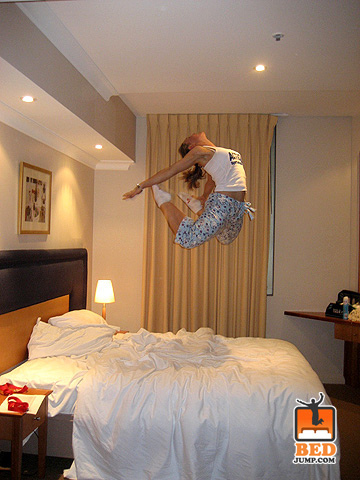 A successful hotel bed jump scene is supposed to take at least an hour to capture. An entire aerobics team used this practice as part of their competition. They said it was really hard to coordinate five people launched and gymnastically posed with perfectly pointed toes and smiles, hovering above the bed at the same time. This is all true. Check out the photos on their Web site: http://www.bedjump.com. So let me get this straight – all that time I spent disciplining my kids for jumping on their beds over the years — was WASTED? I have a feeling the people that find this type of behavior intoxicating were raised by parents that strongly prohibited bed jumping. These kids may, in fact, suffer festering resentment because they were prevented from acting out these impulses. Bed jumping for young adults who have left the nest may constitute a form of therapeutic healing. Who could have guessed? Their parents might have considered buying them a trampoline instead of crippling them emotionally. Bed jumping is not big news – it is simply being brought to light now. I remember when, as a pre-teen, a sleep-over entailed lots of sneaky bed jumping, routinely accompanied by giggling, which ultimately culminated in a lot of parental yelling. 1. We couldn’t seem to jump quietly, thereby avoiding parental yelling. 2. The beds would sometimes collapse. Parental yelling. 3. Our heads occasionally indented the ceiling. More parental yelling. 4. There loomed the very real threat of parental grounding, which was way worse than parental yelling. Besides, we had lots of other cool stuff to do, like eating four tons of Chicken in a Biscuit crackers and making calls to boys to let them listen to our mysterious, labored breathing; then hang up. Apparently, bed Jumping is a spin-off of “art jumping,” which I had never heard of, either. Art jumping entails covert leaping in front of famous pieces of art and snapping a photo while suspended. Even my daughter, at her wedding, insisted upon a ‘groom and groomsmen’ jumping picture. There they were, in all their youthful, exuberant glory, smiling giddily in mid-air. Does jumping fill an innate psychological need that was somehow denied in early development? My husband, who has a camera glued to his hand at all times, has studied the bed jumping web site. I could almost see smoke exiting his ears as his brain chugged into overdrive creating hotel bed jumping scenes. This discovery has unfortunately dove-tailed with our two-day drive home for Christmas, which entails an overnight hotel stay. I am guessing his parents didn’t let him jump on beds, either. If he digs out the tripod, I am going to book a separate room. Gee, and I thought I was hip because I knew what “planking” was. Haha!! I actually have pictures of my husband and myself doing this…(he did actually talk me into it)…but I could not find them to post!! It is hilarious, and certainly a good way to keep those pesky pounds off. Exhausting!